Nails in need of a trim. Monday, I covered easy, hands-off techniques for maintaining your fox's nails. Today's article is about tips and tricks you can use for trimming a fox's nails. The actual act of cutting a fox's nails is identical in most respects to trimming a dog's nails, and every trimming tool is different, so this isn't so much a step-by-step guide as it is tips that will apply no matter what tool you're using. If getting their nails done is an established part of the routine, the fox will put up much less of a fuss about it later. Foxes, and most canines in general, are very sensitive about having their feet messed with. This natural aversion can be difficult to break, but like most things with foxes, patience and persistence will pay off. A few times a day, during both play and rest, examine your fox's feet. 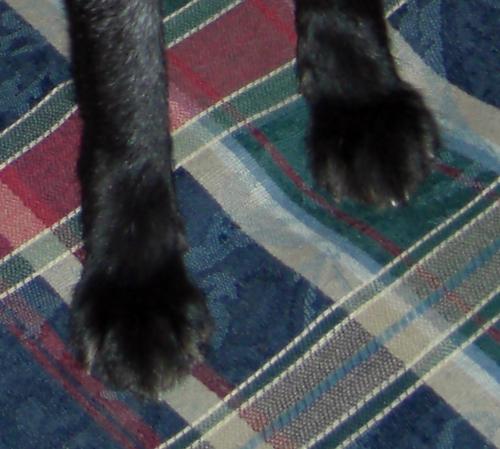 Touch them, look at the paw pads, gently spread the toes so you can get a better look at the nails, etc. Be gentle during your examinations, and work them into the routine. Over time, this will help desensitize your fox to having their feet touched. Even after your pet fox is comfortable with having their feet handled, continue this practice. Ideally, for every one time you trim your fox's nails, there should be ten times that you just look at them without clipping. This will help to prevent your fox from associating getting their paws touched with the clippers. Because there are so many varieties of clipper, I can't give specific instructions on how to use them all. I will say that it's generally best to avoid "dremel" style nail-grinders, as the noise they produce tends to freak foxes out. It's much easier to clip the nails on a sleepy, worn-out fox than one who is hyper and ready to play. Depending on how toy-possessive your fox is, giving them a ball to chew on while you work on their nails can be a very effective strategy. I wouldn't recommend giving them a particularly new or well-loved ball; if it's too much of a treasure, the fox is likely to be protective of it. Another technique is to have someone else rub and pet and distract the fox while you trim the nails. Foxes are not very forgiving if you nip the quick while cutting their nails. It's best to leave the nails a smidgen too long than risk hitting the quick. The toe nails are at their sharpest right after they've been clipped--use caution until the fox has had a day or two to wear the straight edge down.